At first cut, the idea of combining fine leaded glass crystal and Vikings doesn’t make a lot of sense. What good is a Viking with a glass jaw? The crystal in question is Waterford Crystal, and as we were in Waterford, Ireland it should come as no surprise we toured the crystal factory and store. Waterford Crystal started off over 200 years ago, in 1783, and has existed (or not) with varying degrees of success since then. Things moved along well, at least at first, with the crystal gaining a good reputation. Then, in 1811, the first major snag hit when the government imposed an export duty on flint glass (an early version of leaded glass). In 1825 they increased the duty, reducing the margins to a point of questionable profitability. The company struggled on for another 25 years, but by 1851 it had become unsustainable and the factory closed. Fast forward nearly 100 years. Come 1947, Charles Bacik escaped the onset of communism in his native Czechoslovakia, and after recruiting glass artists from around continental Europe started a new factory in Ballytruckle, a suburb of Waterford. One of these artists was Miroslav Havel, another Czech. 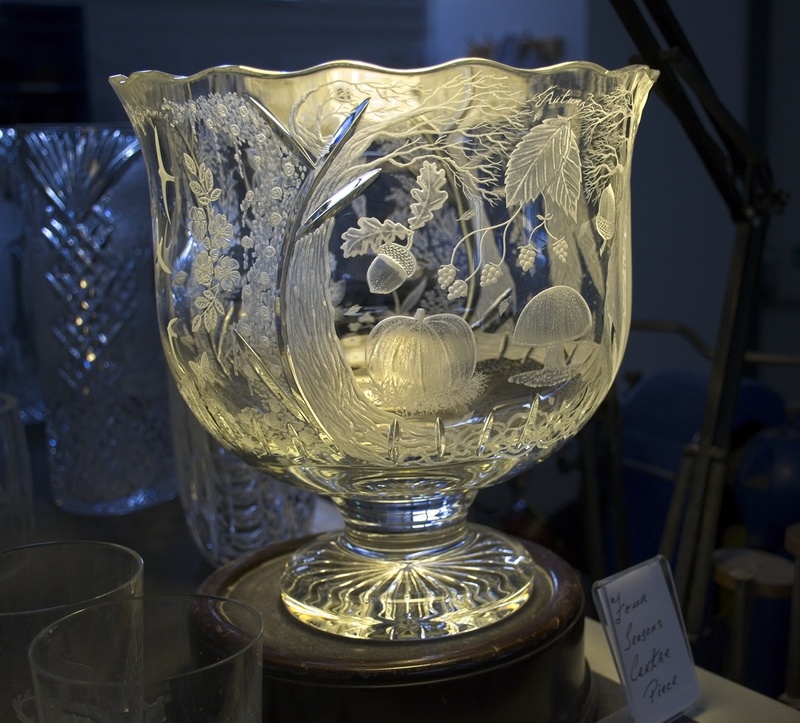 Miroslav was skilled in several glass disciplines as well as design; it was he that resurrected the patterns from the original factory and created the Lismore pattern, Waterford’s most popular. Starting in 1955, the company was turning a profit. Things took off from there. They built new factories. They bought new companies, including and Wedgwood and All Clad. Everything looked rosy. At least until the late 1980s. The declining dollar and declining demand, labor costs, and other issues caused a financial crisis. Only acquiring new investment in the early 90s saved the company. And again, for a while, things developed and things grew. Their fame spread, and even the millennium New Years Eve ball in Times Square used Waterford Crystals. Then 2008 hit, along with its recession. Most folks didn’t have extra cash to lay out for fancy glass doodads, and the company nearly went belly up, going into receivership. Pieces of the company were sold, deals were made, and once again they scraped through. By 2015, what was left was acquired by the Fiskar Corporation. 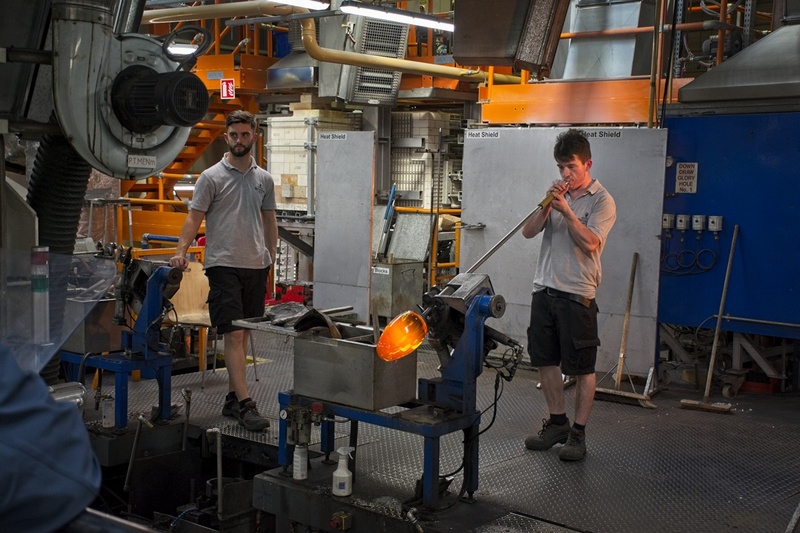 The latest Waterford Crystal manufacturing facility, located in downtown Waterford, melts down over 750 tons of crystal and produces over 45,000 pieces each year, using traditional methods. Since its opening in June 2010, over one million people have visited the Retail Store and enjoyed guided factory tours of the manufacturing processes. In the history section, I mentioned a fellow named Miroslav Havel, and the fact he was versed in several glass disciplines. 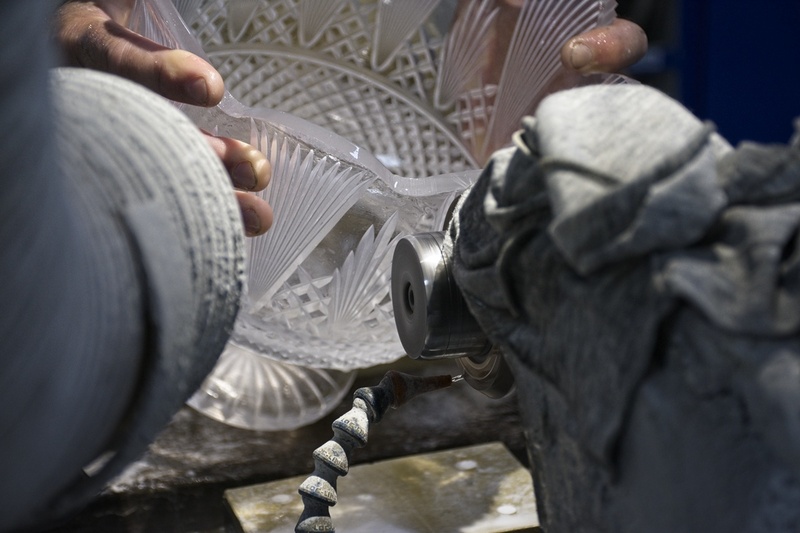 When it comes to crystal, these are the ones that count: glassblowing, cutting, sculpting, and engraving. I have to admit, before the tour, when thinking of fancy glass crystal, glass blowing was not something I would have considered. But some crystal designs come in bowl or vase form, so why not? What I saw of the discipline looks like any other glass blowing studio I’ve ever been in (including my sister’s). 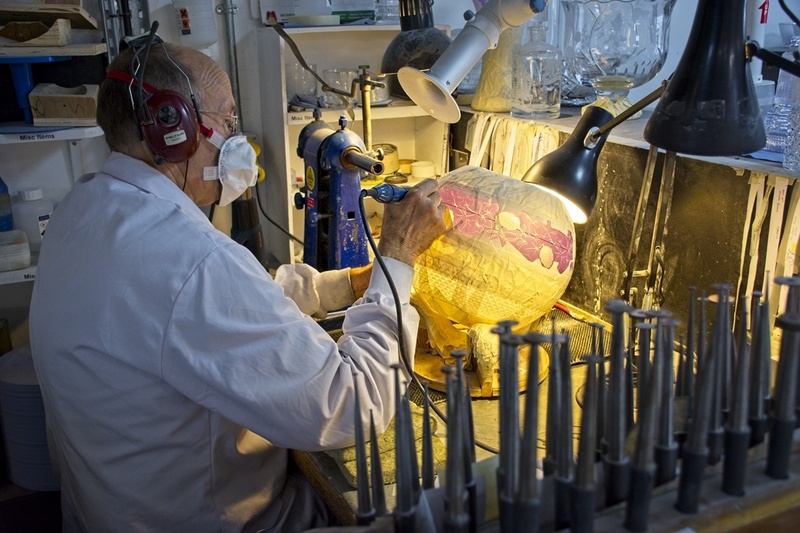 I assume they’re blowing the glass thicker than the typical studio so they can carve on it, and of course there’s the lead component that would make it heavier. They don’t seem to use color as much, and will use molds for specific shapes and patterns. Ever wonder how those fancy patterns make it into glass? It’s not all automated or cast. Sometimes there’s an artisan behind it, creating a series of cuts, each just the right length and right depth. Nothing to it. All it takes are strong, steady hands, a precise idea of the desired pattern, the ability to “see” the result before you cut then cut what you “see”, patience, and NO MISTAKES. Anybody could do it, right? Glass sculpture will often start with one or more solid blocks of glass. The block may be cut into smaller blocks, each of which is carved and polished, much like sculpting in marble. Some pieces may be a straight up sculpture, others may be composites of many smaller pieces, carefully sized and fitted together. Engraving is a more freehand method of cutting a design into glass. It can use drills with a selection of bits that would make your dentist jealous, or sandblasting. Here, a pattern was laid out on paper then transferred to a bowl, where it was used as a template to ensure all the subsequent cuts occur in the correct place. You’ve heard of death from a thousand cuts? For these pieces, it’s life from a thousand cuts. Each of these disciplines is a unique skill, and the practitioners, for the most part, specialize in just their one discipline. Achieving even journeyman status takes four years of training for a skill, and mastery closer to eight. You can see how polymaths like Miroslav Havel could be so rare. Let’s visit Veðrafjǫrðr. (Bonus points to anyone who can pronounce that. I scored zero.) Veðrafjǫrðr, or the more readable Vadrarfjordr, is the original name for Waterford. And who hung those monikers on it? 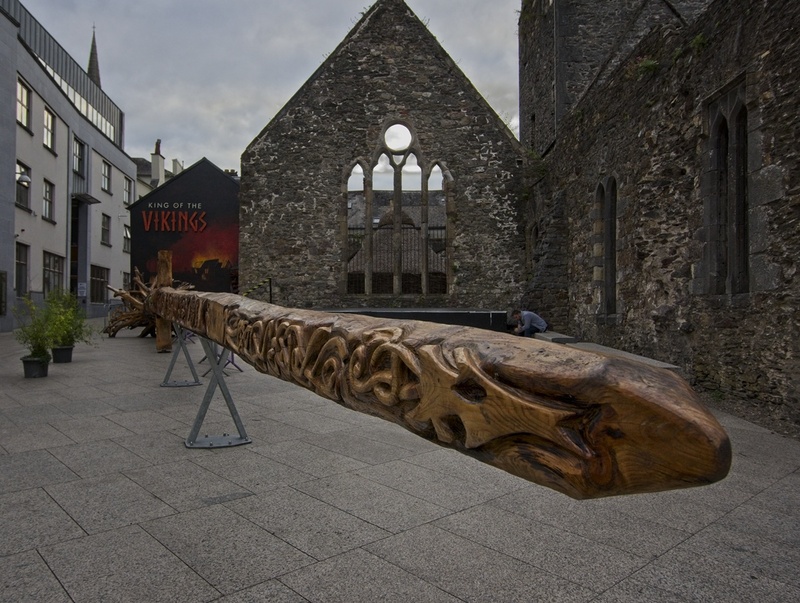 Ask the average guy on the street about what the Vikings were up to in Ireland and he’d probably give you a funny look – as if you had horns growing out the side of your head. And no, the Vikings didn’t have horns on their helmets. That’s a myth, perpetuated by the headgear of the fat lady singing in a Wagnerian opera, or possibly by the horns painted on the side of the helmets of a certain Minnesota football team. It may be possible that the Vikings were described as horned devils by some. They did have a reputation for raiding and looting Irish monasteries – that’s not likely to gain a favorable description by the Irish monks. It would take only a little exaggeration to describe their swords. In any case, the Vikings established a settlement near Waterford in 853, but were driven out in 902. In 914 they were back, and built and named what would become Ireland’s first city. Prior to that, Ireland was rural, with small settlements here and there, often centered around monasteries. The Vikings and the Irish somewhat coexisted and somewhat had power struggles for the next couple hundred years. Eventually, a deposed Irish king made a deal with Norman mercenaries, and after the siege of Waterford in 1170 the Normans took de facto control. But none of this suggests what the Vikings and Waterford Crystal have in common, apart from a location. While the Vikings were driven from power, it’s important to remember they lived in the area for hundreds of years, likely hooking up both with other Vikings and the locals to establish families. The Viking DNA is still alive and well in Waterford. 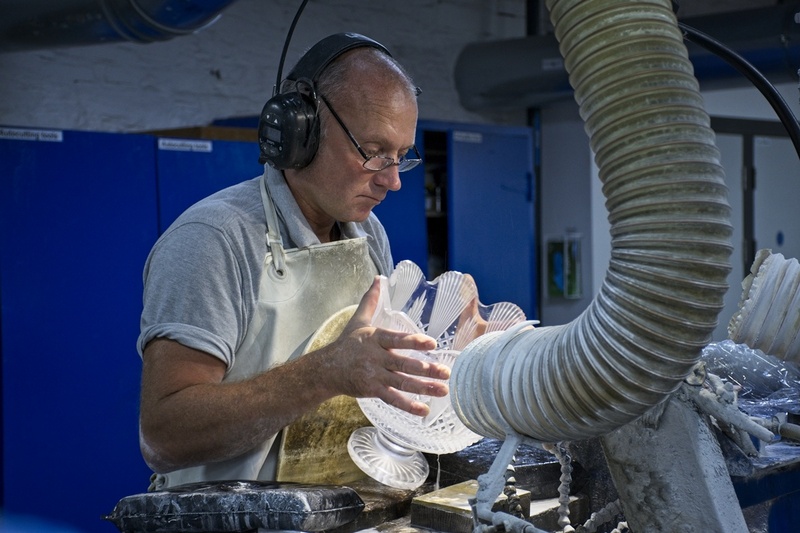 And some of those contemporaries with Viking DNA are likely creating works of art at Waterford Crystal. Unbelievable craftsmanship goes into making these beautiful crystal vessels. As a guy who can barely draw a stickman, I have a particular respect for their hand/eye coordination, not to mention their artistic intent. The crystal … well, the process is interesting, but I’ve never been a big fan of cut glass. But the SWORD?! And the stone tower and the longboat and the Viking history … I perked right up once Waterford got changed back to Veðrafjǫrðr! I would have never known of the connection. Very cool. I’d have to admit the tour was more interesting than the store. No souvenirs for us beyond the pictures and memories. But that sword was cool, a little bonus that the rest of the group didn’t know about. Too bad we didn’t have time to investigate the Viking museum. Wow you are/were in Ireland. How cool. 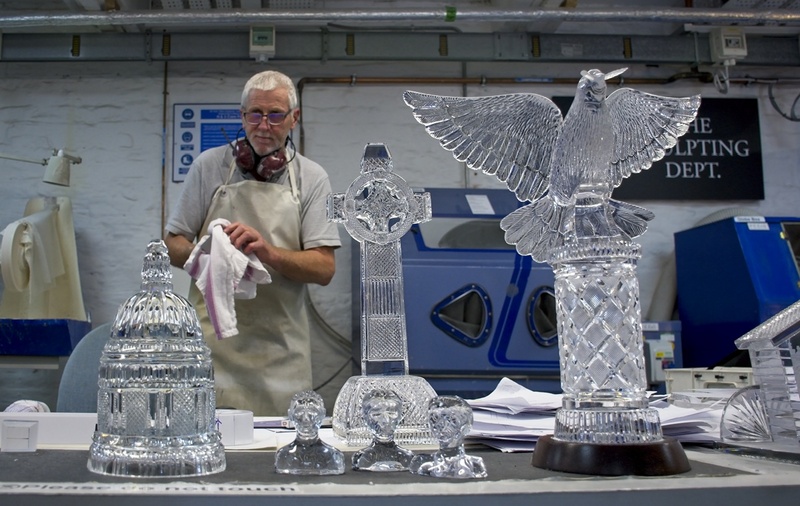 Who hasn’t heard of Waterford Crystal? But I had no idea of the history, where it is created or anything else. So thank you for the education! Am not a huge fan of carved crystal but I do appreciate the skill and mastery which goes into the art. Love the sword and viking boat and that whole connection and that awesome name haha…who knew?? Not me! Hi Peta. We’ve been back for a month, but I have enough stories from Ireland/Scotland to keep me posting for months to come. This one’s already #6. My interest for these two sites (about 10 minutes walk apart) pretty much parallels yours. Fantastic posting, Dave. We drove by Waterford in our tour of the island, sorry that we did not allocate time for an overnight and touring. Thanks, Michael. We didn’t have much time either. It would have been interesting to check out the Viking museum too. Dude… people have been seriously injured trying to pronounce names like that. Safety first! … and in late news, three tonsils from the south side of town tangled with the tongue while it was twisting around obscure accent pylons. Medical units were called to investigate, but only a sprained tongue was found, limping its way onto the next clause. I agree with Almost Iowa, I tried that name without warming up, and pulled a muscle, the nurse suggested ice cream for a week. That totem pole sword is Great! The Steuben Glass cutters used to make stuff in Corning, NY that rivaled Waterford, but like your story of up-and-down finances, they shut it down about seven years ago. The Waterford stuff looks pretty spectacular, even though it makes me uneasy even looking at pictures, I know somehow if I was in the room, I’d knock something over somehow. When I was a kid, my folks actually bought a set of pewter goblets for the kids to use, because we kept knocking stuff off the table. But I really like that autumn-theme bowl with the acorns & pumpkins, that would make a fantastic punch bowl, full of cider & maybe a little Bushmill’s. During the tour the guide passed around a good sized vase so folks could get a feel for the heft of it, leaded glass and all. Amazing how many opted not to take it in hand. I do kinda like that autum bowl too; it’s so intricate and almost demands a fall punch that punches back. As for collecting crystal, it seems like the factories depend on folk who want to act like they’re rich without actually being rich. Economic downturns weed them out. I hate to sound dumb, and maybe I missed this in your post, but is crystal a special type of glass? Where do they get it from to melt it down? I find this all just fascinating–my husband did a glass-blowing course once, and it was so amazing to watch! I think the main difference in this glass as opposed to the regular glass blowing glass is the addition of lead or other minerals to make it more reflective. They have the formulas and measurements down to an art. They’ll also remelt glass that’s been sawed off, broken, or had flaws when blown or cast. That may be a reason they don’t color it that much – harder to recycle it. My dad was a big fan of Waterford crystal…thanks for the tour! It can be pretty spectacular in the right light. For me most of the pieces are too ornate, but impressive to look at anyway. 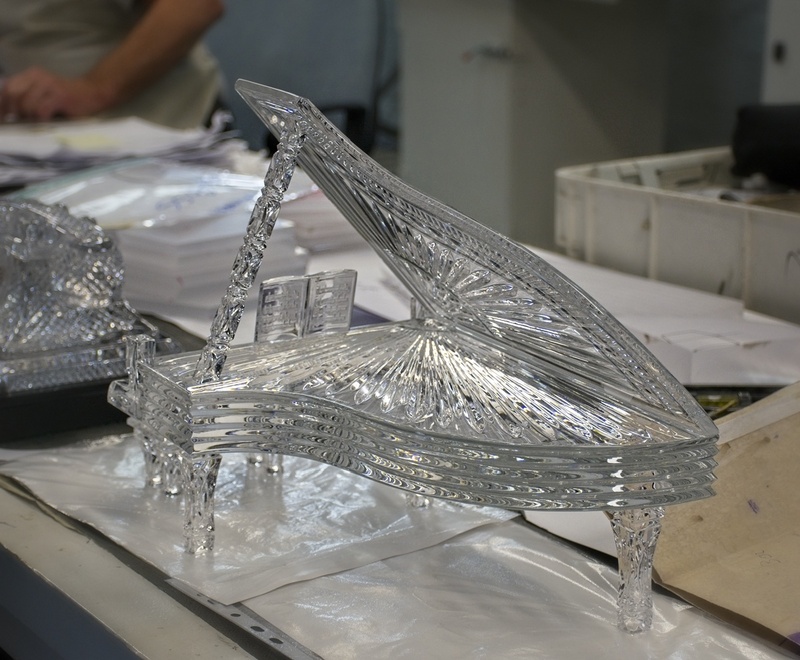 Thanks for showing us how the waterford crystal is made! It’s just fascinating! There sure is a lot of skills involved! Thanks first for the update on the company — it was down at the time of our visit to Ireland. As for vikings, my wife [who loves any glassware] knew she had an Irish and English background. One of those DNA tests, however, showed a strong Scandinavian presence — those pesky Vikings got around. Lucid and interesting, Dave. I remember my Irish grandmother had some Waterford, and one piece in particular that she used as a candy dish. I’ll never forget the heft, as well as my fear of dropping it. I am surprised to learn about the company’s erratic financial history. I suppose it is undependable to sell items requiring discretionary income, no matter how beautiful and well made they are. Could be the main fear would be dropping it on your toes. They do have heft! I’m glad for this detailed account, because we went to Waterford but unfortunately arrived when the factory was closed for the season, just after Christmas. It was a grim time for us in Waterford. I like what you brought in about the vikings, those poor Scots and Irish really got it handed to them by those Vikings man. I kind of can’t imagine anything worse. Maybe the midges. Sorry to hear you had a bad time in Waterford. Perhaps it’s times like those that help us appreciate the good times more. And for those that bring the bad times? May they be stranded 1000 miles from us, and infested with a million midges! Pretty cool, I didn’t realize Waterford were from here! Another place for the list.. Given my childhood habit of smashing, chipping, dropping or otherwise accidentally tampering with my mom’s Bohemia crystalware, I read this blog of yours with increasing unease! Thank Odin for the Vikings at the end, their smashing, pillaging and raiding I can relate with! If I were a parent, I don’t know if I’d be a crystal collector. It’d be stressful enough with regular glass. Somehow, with your affinity for the “stans”, your taste for raiding and pillaging may be more as a reincarnated Mongol than a Viking. 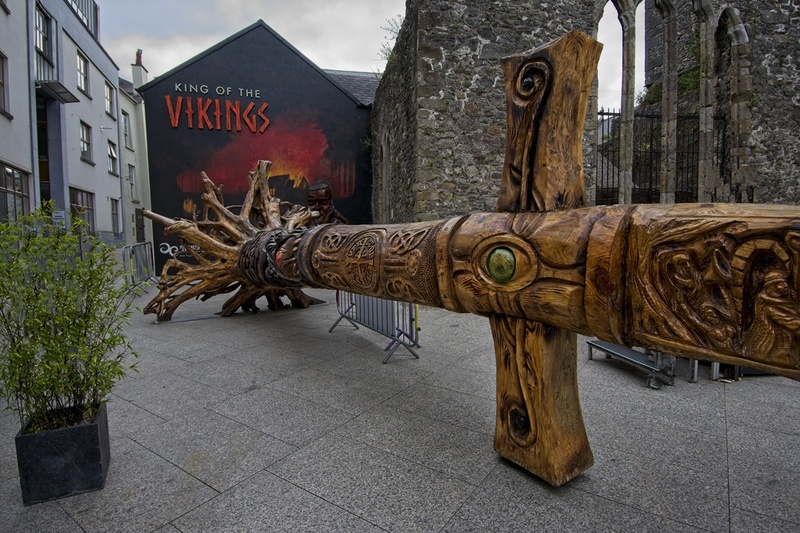 And I journeyed all the way to Scandinavia to learn about Vikings, when really I should have hopped over to Ireland….Is that a…wooden sword? It looks like it belongs on a Peter Jackson film. As for crystal doodads, “death by a thousand cuts” is exactly what I think of when I look at all that breakable glass. Yep, a tree sized sword. Kind of like a totum, in honor of Viking history (Waterford had it’s 1100th birthday in 2014). Guess they made ’em big in those days, wait until you hear about the giants of Giants Causeway. It’s been a long time since I’ve seen a glass-blower at their trade, but I remember how fascinating it was. That sounds like a great tour you had, and love the sword. Funny thing about those Vikings, as nasty as they were on their travels, I heard their home life was pretty peaceful. Ain’t that a kick? I’ve seen glass blowing enough times (and tried it to a limited degree) so I have a real appreciation for the artistry and skills required. Crystal isn’t really my thing (although I did like the punchbowl), but it is impressive what the craftsmen can do. Thank you for the mention! Pity you didn’t go to the Medieval Museum. I was actually keeping my eye on the tourists in case I see you 🙂 I left for vacation in the end of August though. Right behind the sword there is a virtual reality Viking show running every half an hour. It is fun, I think I’ve mentioned it to you. 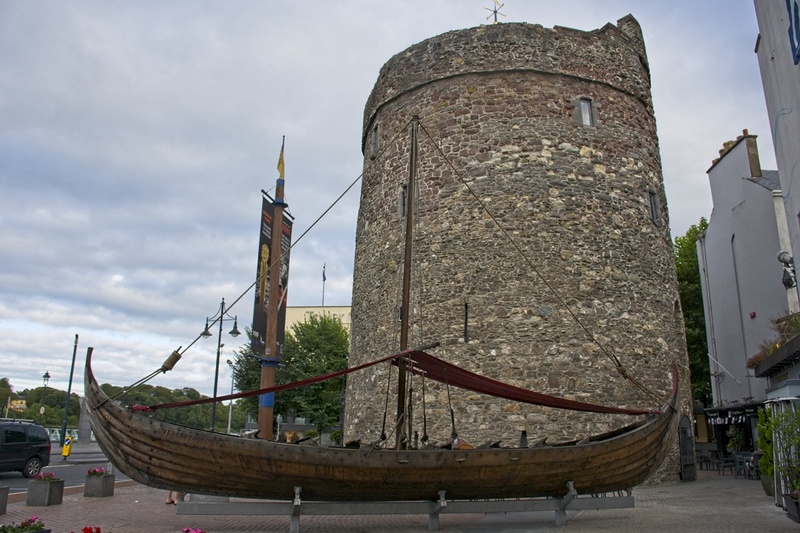 The only Viking museum is the Reginald Tower, and it is not too big, so you didn’t miss much. Waterford Crystal is basically Czech crystal which is not a bad thing at all since their crystal is the finest. Glad you took the tour. Unfortunately we were pretty limited in time. I would have suggested a meet up, but I was uncertain of the schedule, and in any case that night worked out to be our anniversary and I figured I should spend it solely with my wife. (We had dinner at the Reg after checking out the sword.) Maybe we’ll get back to Ireland one of these years, my wife was quite taken with it and I have many blog posts worth of memories.